Jenni is the Weyrwoman of Galen Weyr, rider of the unique brown female Beth (of silver Aravath by ???). They lead the Queen's Wing. Jenni is the mother of a son whom she named Aidrian; now A'drin. She also looks to 23-Turn-old brown fire lizard Cain and 14-Turn-old silver Jaythe. Jaythe has clutched once but started chewing firestone after her second flight, so she won't again. Jenni is 37 Turns old, 5'7", lithe, and has a strong build with a just-beneath-the-surface kind of sensuality about her. She has a stronger jawline than most women, and high cheekbones that make her face look vaguely angular, though rounded just the same. 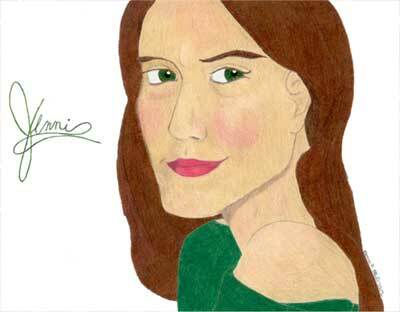 Her skin is a mid-olive that emphasizes her hunter green eyes, and her fine, straight hair is the color of milk chocolate. She keeps it long-ish, falling to the bottom of her shoulder blades (because she's too stubborn to cut it). Beth is about 16 Turns old and has had nine flights resulting in eight viable clutches of size ranging from nine to twenty-four eggs. In order, they are: The first of fifteen eggs by copper Frith; the second of twenty-one eggs by bronze Saganth; the third, by brown-bronze Aidiarth, contained nine eggs including that of the unusual Erith; and her fourth clutch of eighteen eggs by bronze Saganth. These were all conceived and Hatched in Moon Lake Weyr. She concieved a fifth clutch by brown Alinoranth of Moon Lake, but the clutch was lost due to stress from the sudden move to the new Weyr and lack of proper Hatching sands at Galen. She didn't fly the following spring, but the next Turn she laid her sixth clutch of twenty-three viable eggs, by bronze Zaelith. Clutches Hatched in Galen Weyr include that one, her seventh of ten eggs by bronze Zaelith, her eighth of thirteen eggs again by Zaelith, and her ninth of twelve eggs also by Zaelith. For more information about the clutches, go here. In color, she is a light, clear brown, like river water on a sunny spring afternoon. At thirty-four meters from nose to tail-tip, she's on the larger side for a brown but average for a silver (like her mother and largest daughters). She has light Threadscar on her right hind foot that she acquired in her first real Threadfight. She also has scars around her wing-shoulders acquired in various mating flights. Jenni is a very open-minded, outgoing kind of person. She has no problem with the fickle nature of her dragon. However, she does have her serious side and is very loyal to her friends and family--at least until you give her a reason not to be. There's a rarely-seen tender side of her, as well. Seeing people in real pain, mental or physical, awakens a startling compassion and deep need to heal. At Jenni's core is a mender of souls. If you're in trouble, talk to her. She'll try to help you. However, you must expect her to have an outwardly lighthearted attitude. She enjoys the company of people who can take her teasing (or she at least gets a rise out of), and will be your friend for life if you can carry on one of those pointless-yet-entertaining debates that she always seems to win for a credible amount of time. She can't stand attention-seekers that use the 'woe-is-me' tactic to guilt-trip people into being nice to them. Jenni will tell you precisely what you can do with your sad story--as diplomatically as possible, of course. Hidebound conservatives get under her skin as well. She has a sharp wit that stings about as much as Threadscore when she has a mind to use it to that effect. This same wit can also be used to play with words, pun, joke, and tease as befits a harper. She has a LOOK that can flay you to the core, but she only gives it when truly inflamed. Miscellaneous Information: Scent: Leather, woodsmoke, herbs, dragon. Key colors: Hunter green, dark blue, silver, and brown or red. Erogenous zone: Neck, hands to a lesser extent. Glass: Contains 50% of total capacity. Leader of Galen Weyr's secondary Wing, Viridian, O'ma looks to bronze Condarith (of bronze female Juleth by copper Pricanth). He has no fire lizards, but owns two canines. The first is a black-and-tan wolf-dog called Solo. Solo is aloof with an extremely I-mean-business attutide and fiercly loyal to O'ma, but wouldn't harm anyone unless he thought they were going to cause harm to come to himself or his human. Solo has a very nice conformation. He's large, solid-boned, deep-chested, and his guard coat is quite sleek for all that it's rough. His markings are similar to those of a German shepherd, though he looks more like a wolf. He has amber eyes. The second is Eru, a long-legged, long-nosed creature closely resembling the Ibizan hounds of Egypt back on old Earth. Eru comes from the same litter as Aidrian's Tipiolo--of Rayobi by Scribble. He is happily beta to Solo's alpha. The two get along and work well together. Eru is less protective and more friendly, though he won't make a move beyond wagging his long tail until O'ma gives a sign. Everything about Eru is long: muzzle, erect ears, proud neck, back, clean, straight legs, and tail. Even for all that he is solid, a reliable runner and capable of loping along with Solo for great distances. He is brindled all over with the swirling pattern darker on his ears, back, and tail. His eyes are gray-brown. This is a BIG GUY. He worked in the SmithCraft before getting Searched, so not only is he tall (over 6 feet), but strong. He's not so muscled up as to look unnatural, but not many people would pick a fight with him. His hair is somewhere between dark brown and red, like blood-soaked earth, and his eyes are close enough to being black to be called black. He's well in proportion to himself - arms and legs not too long or too short, head not too small. His face is round, but not soft-looking at all. His hands are big and calloused, but if they weren't, they would be very fine, for his palms and fingers are long. He was GOOD at his chosen profession. His age is 34 Turns. Condarith is mostly a rich mid-bronze color with darker shadowing over his eyes, like a roughly triangular patch coming to a point midway between his first neck ridge and his nostrils. His wings sails are a light, brassy, almost gold bronze, particularly translucent and iridescent. He is thirty-six-and-a-half meters long. Deeply eager to please, but not to the point of nonsense. He is fun-loving and intelligent, happy to be in charge when asked, and highly responsible. He balances his rider's quiet seriousness. At 14 Turns of age, he's been in only four notable flights, but he caught green Cath as a result of one. O'ma is a very quiet person, so much so that he could almost be called broody, but the fact is that he just thinks a lot - and, when he does talk, it's impossible to ignore him. His voice, a mature low, rumbling baritone, is just pitched so that it carries a great distance, indoors or out. He displays "point A to point B" logic and intelligence; very straightforward. He has a knack for cutting straight to the heart of an issue. He's a very kind and patient person, and it's very difficult to make him angry, but doing so is, needless to say, not good for one's health. Condescension irks him. In contrast to the typical bronzerider - and perhaps not what one would expect from someone of his temperament anyhow - O'ma is bisexual. This is fortunate, considering his dragon's fondness for greens. Miscellaneous Information: Scent: Earth, leaves, something metalic, dragon. Key colors: Bronze, saffron, dark pine green. Erogenous zone: Lower back, gluteal region. Glass: Is half water and half air in a container of refined, melted, and shaped white sand. At Galen Weyr, G'iles is a Wingsecond under Weyrleader T'leres. He rides black Asteroth (parentage unrecorded) and has a temperamental black fire-lizard called Sefer. G'iles is stocky and muscular, seeming to stand a little over 5'5" but somewhat under 5'9". In other words, he's tallish but doesn't look like it until you get right up next to him and find that you're looking up at him. He has straight black hair that would fall silkily to his shoulders if he didn't keep it tied back all the time. His eyes are dark gray, his skin brown, and his face an elongated square. His nose is short and broad, his mouth is thin, and his eyebrows are thick. His left eyebrow is interrupted due to a faceful of char he recieved as a younger rider. In addition, his forehead, the bridge of his nose, and his cheeks are pockmarked with scars. Not really handsome, but he does have nice eyes. 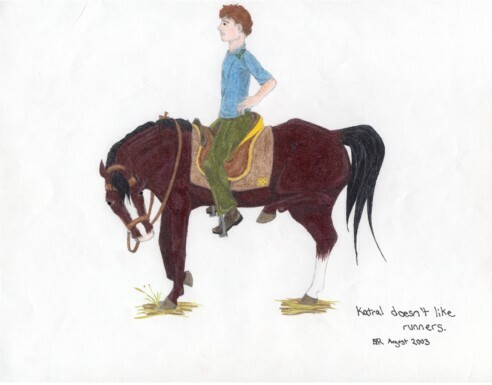 He is 44 Turns of age; the oldest rider in Galen Weyr. Asteroth is big, very, very big. Built like his rider, he's a black monolith of sheer physical power built on a frame thirty-nine meters long. His chest and barrel are very deep, making room for great big lungs and powerful vocal chords, giving him a basso profundo voice that shakes the air when he roars. He is deep velvet black with an occasional fleck of white, giving him the look of a star-studded night sky. He has an attitude that allows him to take the world in stride, not getting upset or particularly worked up over anything. He does have strong opinions, however, which he will calmly and single-mindedly argue until the other individual gets completely frustrated and gives up. He is 29 Turns old. G'iles himself is a kind man with a fondness for young people, though he has no children himself (that he is aware of). He, too, has strong opinions and doesn't mind arguing now and then, though he tries to avoid doing so. He is a strong leader, well-able to make decisions and never second-guess himself. He loves to dance and attempt to sing, though his voice is not nearly as suited for tuneful vocalization as he would like to believe. He has a sense of humor, though he has something of an inability to distinguish between normal talk and things that are supposed to be funny. Miscellaneous Information: Scent: Clean sweat, leather, basil, dragon. Key colors: Black, silver, brown, dark blue. Erogenous zone: Inner thighs. Glass: Leaks. Aswailin is a Wingrider at Galen Weyr under T'leres. Her dragon is green Cath (of brown female Beth by bronze Saganth), and she has a single scarlet fire lizard named Carmody, whose mating flights aren't recorded. Aswailin is about 5'6" and 29 Turns of age. She is average in build and her face is one of those that leaves your memory the instant it gets there. She has gray-blond hair that waves when it is long enough, but she keeps it level with her ears so that it doesn't get in her way. Her eyes are hazel, but mostly look gray-green. Cath is energetic, fun-loving and mischevious; but she would never do anything her rider felt strongly against or disobey orders. She is average-sized for a green at about twenty-three meters. She is colored a dark glossy green, like oak leaves, but she has a nasty scar on her right wing joint, where the "fingers" join the main wing bone. Some of the sail was damaged and so there is a white patch of scar tissue in contrast with the rest of her. Also a thin, jagged line down her left flank where a single strand of Thread caught her unaware. Cath is 15 Turns old. Her first flight was won by bronze Condarith (and Aswailin will always be grateful to O'ma for making her first time a good one); her second by brown Colath of Flame of Hope Weyr. Aswailin is pretty easy-going. She's sweet-natured, open, honest, and truthful. There's nothing soft about her, however, as one might assume. Growing up with several brothers in beastherding Steppes Cothold, she knows how to hold her own. She's physically active, and loves to climb. She will stick up for herself and her friends without being told to do so, for she is an advocate of justice. She dearly loves the world and everyone in it. If her typist could write good poetry, she would be a poet. She likes men, and those with gray eyes especially. She doesn't like overly muscled, hormone-shedding louts. She thinks that fire lizards are nice, and so are felines and canines. Whers give her the creeps, and she despises tunnel snakes (who doesn't?). Miscellaneous Information: Scent: Milk, grass, water, dragon. Key colors: Hazel, light brown, white. Erogenous zone: Breasts, stomach. Glass: Is half full. T'kern is a Wingrider under O'ma, Impressed by brown Perth (of bronze female Juleth by bronze Waroth). He has no fire lizards. T'kern looks as though he may have had Asian ancestors way back in Pern's history. He is wiry even for a young man and not too tall, standing 5'4" (on a good day, with boots on). His skin is light golden brown, his hair straight and black, his wide eyes almond-shaped and dark brown. An accident with an over-full bag of firestone and an untimely clump of Thread left him with 'Scores on his forearms and one long mark on his back that extends from his left shoulder all the way down to his right hip. He is 25 Turns old. Perth is earth brown, and a fine blend of all soil colors, at that. Depending on the light, one might catch hints of sand tan; deep mountain red; rich valley sepia; and overall your common every-day brown. He is also marked by sort of grass-stain-on-brown-leather coloration around his elbows, knees, feet, wingtips, and muzzle. He is emphatically NOT a brown/green mutation; it just so happens that the green that helps make up any brown shows through in certain places. The same incident with the firestone in his first Turn of life left his muzzle and head a network of fine Threadscores. Fortunately his eye ridges protected the eyes. He also has scars on his neck and right shoulder. His right wing healed cleanly. His personality is much the same as his rider's, if a little more talkative. It is not a dragon's way to be shy. Perth is now 11 Turns of age. He has grown to be compact, small for a brown at just under thirty meters, but he is tough and maneuverable in exchange. Strong in himself, T'kern is bold, upstanding, and patient. He won't leap before looking, but he does have a strong sense of wrong and right and defends it when it is necessary. He doesn't go in for much socializing, taking after O'ma in that regard. Unlike O'ma, the reason for his reserve is everything to do with keeping a business-like attitude and nothing to do with deep thinking. T'kern is certainly capable of wisdom, but it doesn't come as naturally as cool intelligence. Also a Wingrider, but in the Queen's Wing under Weyrwoman Jenni. L'el Impressed his albino Minth from the same clutch as T'kern. He has one fire lizard, a green by the name of Greyza. She is an independant creature, rarely showing herself unless she wants food or attention. L'el also has a small canine friend, named Timor for the smaller of Pern's two moons. Timor is descended from terrier stock and, small even for that, he stands only mid-calf to L'el. His curly coat is cream-colored with light brown patches on his back; foxy muzzle; tall, pointy ears; each broad paw; and the end of his short, whippy tail. L'el's hair is sun-bleached blond; his eyes light hazel predominated by sandy brown; and his skin, if he can avoid burning, gets a light cinnamony tan. He also freckles. He is just this side of short, standing 5'7" at 23 Turns old. Minth is the type of dragon known as "albino," but of course he isn't truely albino. His translucent pastel shadings tend toward brown and sea green, but they only show in the right sunlight. He's not the smallest dragon ever clutched at twenty-one meters, but he's only the size of a scarlet or small green nonetheless. Minth is pretty cool and easy-going, taking life as it comes and enjoying every moment of it. He has no distinguishing marks other than his pale hide. Like his brother Perth, he is 11 Turns old. L'el was Hold-reared with all the right history and tradition. He is quiet, honest, trustworthy, and a fast thinker. He's friendly and loves to talk, but he's also careful not to say too much for fear of embarrassing himself. He also has a slight tendency to do unexpected things when he feels they need to be done, like come up out of nowhere to save a runty canine pup from torture; stand up in the middle of dinner to speak for a little girl who did NOT touch the bubbly pies; and even hit an older boy who was teasing the watch-wher. While still a suprise, it follows that he should have helped albino Minth to crack his too-thick shell. A'drin is the son of Jenni and an unknown Moon Lake rider--either K'tet, rider of bronze Saganth, or K'lyr, rider of bronze/brown Aidiarth. He is a senior weyrling under R'byn, newly bonded to blue Vivifith (of silver Amaranth by brown Tavarth). 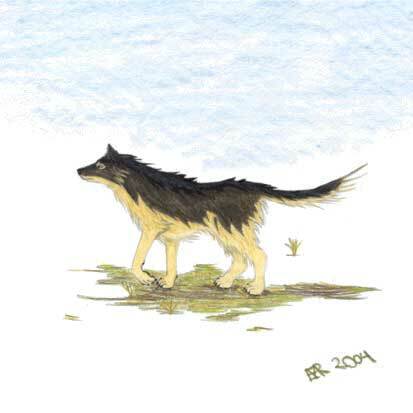 His other best friend is Tipiolo, a canine of Rayobi by Scribble who was a gift from K'lyr. Tipiolo is of a hound type resembling the Ibizan hounds of Egypt back on old Earth. Her back is level, her neck long and proud. Her ears are erect atop a smooth skull of equal length to the muzzle that projects out from it. Her long legs are clean and straight. Her only flaw is a kink at the end of her whippy tail. Her coat is blue roan; that is to say that the hairs are gray with black tips, giving her a blueish look. She also sports a black marble pattern on her sides and flanks which emphasizes her lithe, sinewy grace. She is a rambunctious creature, very playful and affectionate to everyone, but especially A'drin. He also has two Turn-old fire lizards: a gray called Leof and a green called Ferde. The two are siblings and come of a clutch by gold Kinshou-ichi and a wild bronze. A'drin is a tall, sturdy boy with an unruly mop of auburn hair on his head. He got his mother's light olive skin and strong jaw. His eyes are hazel--brown with gray-blue and green shades; deep, intelligent, solemn eyes. He takes strongly after his mother's side of the family and bears a resemblence to his great uncle Balen. Vivifith is just a Turn old, so his exact color and size are sorting themselves out. He has a cool head for a hatchling, inclined to use his nose and make sure he has his balance before trying anything adventurous. On the other hand, he shares his rider's curiosity. He loves completing his lessons so he can move on to the next one. At 14 Turns old, A'drin is young for a weyrling. He is active, curious, and independant, but he is also quiet, serious, and hard-working. It is rare to see him smile except when he thinks himself alone with his dragon. This is not to say he isn't happy the rest of the time, just that he is very self-contained. When dealing with other people, he is polite, courteous, attentive, and helpful. He knows all the ins and outs of his mother's Weyr, so he is a good source of information for a newcomer. However, because he grew up younger than most of the candidates and older than the other weyrbrats, he lacks the skills to really interact with his peers. When he stops to think about it, it bothers him that he's an outsider in his own home. Miscellaneous Information: Scent: Dragon, leather, musk. Key colors: Olivine green, brown, gold. Erogenous zone: Unknown. Glass: Who cares what's in it as long as it's doing its job well? Alric is the MasterHarper of Neopian Pern. 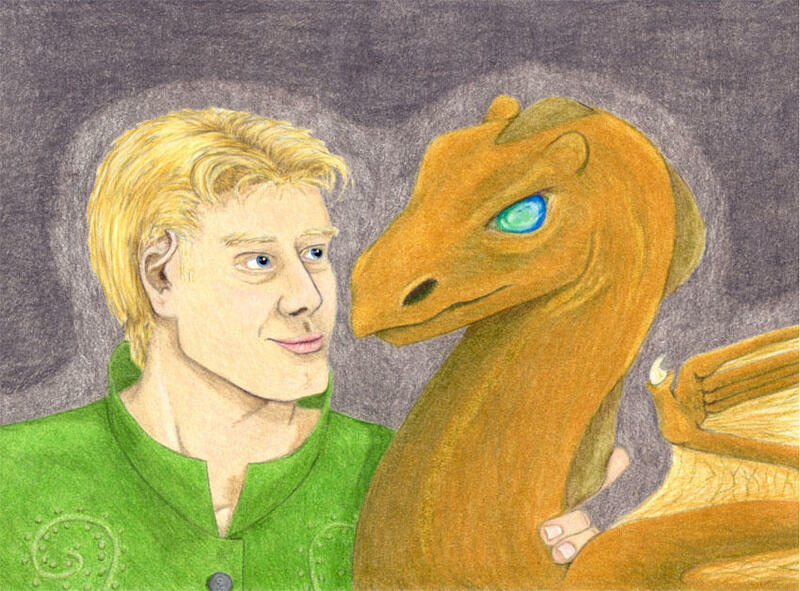 He thusfar has no spouse and no children, but he does have a bronze fire lizard named Zyanral. They have been together for all of the fire lizard's 42 Turns of life, but Zyanral is still as good as the day he hatched. 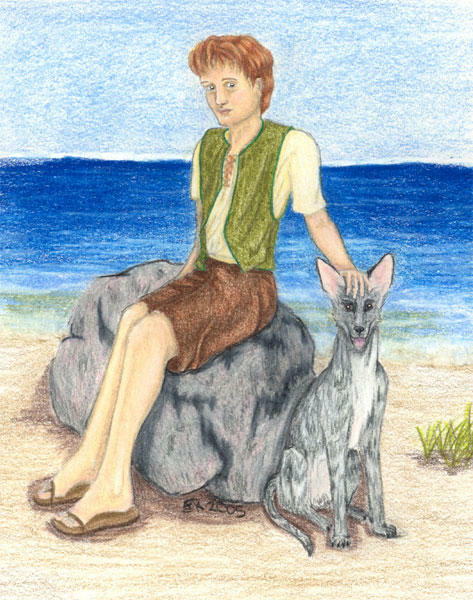 Alric is the second of five children. He has one older sister (Chessi, 64), two younger (Siri, 53; and Rica, 51), and a younger brother (Balen, 47). Here is a quick-facts page for the whole family. Master Alric is 59 Turns old, about 5'10", lean, with thick, wavy, sandy-blonde hair and snapping grey-blue eyes. His hair may be graying slightly (those crazy apprentices! ), and his face might be weather-toned and a bit lined (those darn journeymen! ), but it really only adds to the roguish look he has about him. Why on Pern is this man single? He has a keen sense of humor and is generally quite friendly. He takes the neutrality that is implicit in his Craft seriously, and doesn't take sides in any issue before serious consideration. Smoothing ruffled feathers is almost second-nature to him and his soft baritone speaking voice. He can be stern at times, but he never means anything personal by it. He expects everyone to live up to his high expectations, but, after initial disappointment, won't think less of you if you don't as long as you do your best. He's always accompanied by Zyanral. 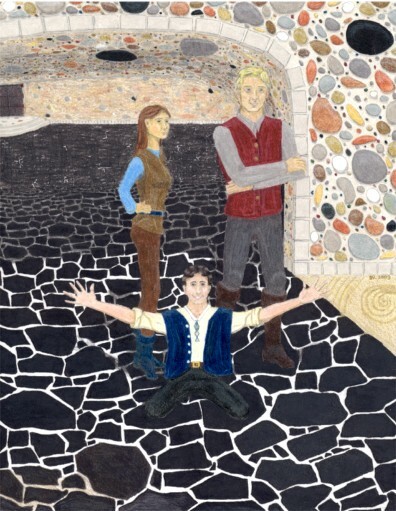 Alric also acted as guardian to his sister Chessi's twin daughters, now adults: Jenni and Ame. This fact is bound up with some unpleasant family business and kept strictly hush-hush around the Halls; so naturally all but the newest apprentices are aware of it. He treats his apprentices like the children he never had. He has been known to do everything from helping a confused and frightened 13-Turn-old girl choose a new tunic to listening to the agonized embarrassment of a 17-turn-old boy suffering from new manhood. There isn't much he can't or won't deal with. He has just about seen it all. Aside from being MasterHarper, Alric's particular facets in his Craft are Theory and Diplomacy with singing and playing saved for special occasions and his own personal amusement. He does sing well enough, being a baritione slightly stronger on the higher end of his range. He teaches Theory and occasionally Chorus at the Hall. Miscellaneous Information: Scent: Paper, rosin, sun-warmed earth. Key colors: Russet red, gray, medium blue, warm yellow. Erogenous zone: Ears, hair. Glass: Makes a lovely tone when "pinged" with a fingernail. Rediral is a traveling circus clown - er, journeyman harper! - who is faithfully acompanied by blue Kir, who is 19 Turns of age and randy as any bronze. Has he flown females? Oh, yes, definately yes. The pair are currently posted at Galen Hold, investigating the mysterious lack of grubs in the area. Rediral also seems to have a way with females. He's 5'11" in height, with dark hair that is wavy at best and curls when wet and hazel eyes. His age is 37 Turns, and his build is that of someone used to traveling a great deal: wiry. He comes from a hold in Tillek and maintains a preference for Tillek white wine to this day. It is little-known truth that he has a younger sister, but she was born shortly before he began his apprenticeship at the Harper Hall, so he doesn't know her well. Rediral is a scamp and a rascal, and there's no other way to describe him. He's a terrible flirt, he's absolutely shameless, and to top it all off, he's a harper! Honestly, what more needs to be said? On the other hand, he can be serious if he really has to and he wouldn't make anyone uncomfortable if he could help it. In other words, if you want him to go away, tell him. He'll pout a little, but he'll get over it. Kir, who shares his Impressor's personality, isn't much better. The two have a tendency to augment and intensify each other's drives, which gets... interesting... at times. Rediral's favourite past-times, when he isn't flirting with the local girls, are playing guitar and gambling (which he's actually quite good at unless he happens to be in Bitra Hold). His first loyalty, however, is always to Master Alric and the Harper Hall. Rediral doesn't sing often, though he certainly can. He's not particularly proud of his tenor voice and strong falsetto (but by the Egg, the Harper Hall is!). He prefers to play his gitar, lap harp, or double flageolet and to teach the people young and otherwise wherever he's posted. Miscellaneous Information: Scent: Leather, runnerbeast, rosin. Key colors: Copper, light ocean blue, silver-gray, deep red. Erogenous zone: Depends on the situation. Glass: Ought to have wine in it. Katral, a journeyman healer, looks to 8-Turns-old blue Tulp. Tulp is a horrible little beggar for attention, but he minds his Impressor. He has been well-trained by Katral to fetch and carry tools and can recognize most healing herbs by sight or smell. Katral is 25 Turns old. He is from Lemos, where he grew up after he was fostered into his father's sister's family. He is of slender build, average height and creamy skin with mussy russet red hair and gray eyes. His face and limbs are dotted with freckles, and he sprouts a bit of a scraggly goatee. He is bony but well-shaped, especially about the face. He is as fit as anyone on Pern, preferring to walk places when at all possible. He has a deep and abiding dislike of runners (they feel the same way about him) and going between makes his head spin. He doesn't know it, but he very much resembles his mother, Rica, in coloring and build. He's seen her only a few times in his life, and doesn't really know anything about her or her family. The same can be said of his father. However, he was raised by his father's sister's family in a home full of love and as a result he feels that he never wanted for anything. On a good day he is friendly and kind, willing to josh around with his friends, and occasionally will even come out with a joke or two. His sense of humor is dry and often wry, full of cynicism grown out of a stong dislike of the foolishness and stupidity of pampered people. He is a responsible, caring man, but his compassion is often overshadowed by irritation at not being able to do his job properly due to ignorance on the part of others. Still, he does his best and hasn't succumbed to bitterness yet. One of his greatest ambitions as a boy was to learn to shape the hard Lemos jade into the mortars and pestles used by his chosen Craft, though this looks as though it will remain a dream. He takes his status seriously and won't dare to fool around on other people's time. The one time he got into trouble by pure unlucky circumstance was enough to deter him forever. His Craft will always come first with him. He's content to make some friends, learn all he can, and do what he's told. As a journeyman, he has elected to undertake studies to become a surgeon, one of the rarer practices on Pern. He feels that he can do it if he works hard, and that it is needed. This goal drives him in all things. He is currently stationed with the Healer Hall at Cape Hold, where he is training to work with the local dolphins in diagnosing harmful tumors and other operable internal disorders. Miscellaneous Information: Scent: Old books, dust, salt, people. Key colors: Red jade, forest green. Erogenous zone: Not easily stimulated. Glass: Has some water in it. Siri is one of Master Alric's younger sisters. She was of the Weavercraft until a few Turns ago, when she had the fortune to visit a seahold and meet a pod of dolphins. She decided then and there it was time for a change in her life and got on a ship for Cape Hold to join the Dolphin Hall there and, as a bonus, be near to Jenni, her neice. Now she's dolphineer to Alta, a 22-Turn-old female. She also looks to Lalix, a 29-Turn-old green fire lizard. Siri is still a lively and active woman at 53 Turns, though her hands cramp every so often in memory of long days before a loom. She was never remarkably pretty, but there is a subtle loveliness in her round face with its gray eyes and long, silvering platinum-blond hair. She is slight like her mother, but hours in the water with Alta have built muscle in her. Her skin is sun-toned and has taken on a rosy and gold underglow. Alta is a large, medium grey individual with striking marks on her melon and a series of sweeping rake marks down her tail. She is mother to Tania by Poll and to Opie by Cas. Both daughters are a source of pride to her. Tania resembles her mother and also won the affections of Cas, resulting in Alta's grandson, Sada. Alta is participating in the Dolphin Diagnostics program of Cape's Healer Hall. She enjoys the "finding" game immensely and hopes to encourage young Opie to join when she becomes an adult. As the older of two sisters born close together, Siri learned to be quiet and responsible in sharp contrast to Rica's wild ways. Siri looked up to Alric and Chessi and did her best to follow their example. The lessons she learned hold true today. She is a good listener, a clear speaker, and patient with younger people. She doesn't make friends easily because she likes to observe people before getting too involved with them, but once she decides she likes you you've got a friend for life. This only holds true with humans, of course. Lalix and Alta both took to her instantly and she couldn't help but return the compliment. Retired Journeyman Healer Ame is not only the niece of MasterHarper Alric, but the twin sister of Weyrwoman Jenni. She has one gold fire lizard, Rill, who is 23 Turns old, intelligent, and protective of her Impressor; also albino fire lizard Remet, who is timid, not very strong, and spends most of her time sleeping to conserve her limited energy. She is 14 Turns old. Rill does not rise to mate as often as a typical gold fire lizard, as she is inhibited by her person. Ame is 5'7", 37 Turns old, has brown hair to her jawline, and forest green eyes just like her sister's, though they rarely show any remotely unfriendly or harsh emotions (if they show any, these days). She's fond of wearing pastel blues and greens, and until several Turns ago she wore no other ornamentation than her journeyman's knots. Now, however, she lacks the knots and a bracelet of green copper vines with a graceful gold fire lizard for the clasp encircles her right wrist. Ame is entirely different from her twin as far as personality goes due to a singular horrid event in her past. When she was fourteen, she was raped by her father. That and whatever he said to her effectively destroyed her self-esteem, leaving her with the opinion that she is weak, insignificant, and not a suitable match for any man. Ame's mind is now a network of vicious cycles, but to her thought it serves as protection from more pain, which is why she's still a mess at the age of 37. She was exceptionally good at her Craft, but will never admit it to herself or take any credit that she can deny for her healing. She was one of the most sensitive, caring, empathic individuals one was likely to meet, willing to put everyone before herself even when she's scared of potential consequences; though if she could help it, she avoided contact with men (convinced by her father that they could only have one possible use for her). She recognizes that the way she carries on with her life is pathetic, but sees herself as too weak and afraid to do anything about it. She is now living in New River Hold with her uncle Balen and his family. Their isolated, family-oriented lifestyle seems to be having a positive effect on her. She helps Danya around the hold, keeping things in order and minding the young children. She doesn't speak often, but she smiles now and then. Ame studied as a nurse, which means that she knew most of the aspects of her Craft well enough to be of reliable service to another Journeyman or Master. Jenni and Alric swear that she could have been a Master if she had tried, but she never found the strength to do it. She was terribly clever with hands and herbs, but her abilities have gone unused for so long now that she's lost much of what she knew. It could probably be recalled in an emergency, but her family is working hard to see that she's never faced with one. Miscellaneous Information: Scent: Rainwater, sand, herbs, clean clothes. Key colors: Pastel forest green, white, light cerulean blue. Erogenous zone: Palms, arms. Glass: Contains water that should be used to fill someone else's cup. Den is the oldest child of Balen and Danya of New River Hold in Keroon. As such, he is the nephew of MasterHarper Alric and first cousin to Weyrwoman Jenni. He has one sibling, younger sister Anya. He has no pets. From birth, Den was meant to succeed Balen as holder and follow him in the Tannercraft, and Den was fine with this plan. He enjoyed the Craft and even took an interest in management from an early age. However, when he turned twelve, the dragonriders changed his mind for him. Now, eight Turns on, he can barely recall all of the numerous Hatchings he stood for, even less tell anyone why he kept at it despite failing each time to Impress. Perhaps it was a form of teenage rebellion. In any case, he accepted being shuttled from Weyr to Weyr with dignity and didn't complain--at least, not in anyone's hearing. At nineteen, he ended up at Galen Weyr and stood for the last time. He did not Impress that day. However, Jenni offered him a chance of a different sort. Perhaps Den was compatible for dragonkind, but not the dragons themselves. Galen had recently become home to a young gold watch-wher (Tirsk) and her handler (Tiria). The gold would need a mate eventually--how would Den feel about bonding with a wher? He would have to travel to Southern Hold to present himself for an egg, raise the wher for seven months, then travel back between times to be there for Tirsk's mating. Den decided he liked the challenge. Den's watch-wher bond is bronze Desk. He's large and intelligent for his kind, eager to learn, and easily bored. He has been trained to channel his energy appropriately, but he's still all the companion Den can handle. The two revel in their bond, each challenging the other and pushing for the next level. There is no doubt of their mutual love, either. Becoming a night creature has unlocked the fire in Den's spirit. At 22 Turns old, Den is tall (5'9") and sturdy. With both parents blue-eyed, he had little choice but to inherit the same. He has his strong features from his father's side, but a certain refinement from his mother's. His skin was once tanned bronze from exposure to the sun and sand while his hair was bleached light gold, but now his skin is growing pale while his hair darkens. This doesn't change the fact that he's considered quite good-looking, but he couldn't care less either way. If he makes an effort to spend time in the sun, it's for his health. Tiljim is the Lord of Cape Hold, a southern Hold that looks to Galen Weyr. He has no children and no fire lizards, but he does act as dolphineer to Aldeb. For more information about Cape Hold, go here. Tiljim himself is 43 Turns old. His tall frame is wrapped in hard, flat muscle from head to foot, which is in turn covered by tan skin toughened by exposure to sun, salt water, and wind. His face is long, rectangular, and prone to a wide smile. He has blue eyes and light umber-brown hair that curls loosely about his skull and flops onto his high forehead. Aldeb is a 31-Turn-old bull with a curving, sickle-shaped scar on his slate-gray melon. He is an impressive nine feet in length and bears various nicks in his tail, flippers, and dorsal fin as well as a myriad of minor scars and rake marks. As dolphins go, he is a roguish, handsome fellow. He has sired three calves: daughter Nekka out of Bela, son Rige out of Bet, and daughter Cenni also out of Bela. His best friend is Rook--the two share a pair-bond and are rarely seen apart. Their bachelor pod is usually joined by Reggus and sometimes by Poll. Tiljim is a seaman forced to divide his time between the Seahold and the main Hold (of course, he volunteered for the job, so he can't really complain), taking an interest in dolphins on the side. He speaks regularly to the leader of the resident pod, Bela, and finds the creatures fascinating. He is a lively, active man with a wit to match. He doesn't set much store by formality; however, when he says "jump," he expects his people to reply, in unison, "How high?" Generally speaking, they do so with smiles and alacrity. Tiljim is not yet espoused, but he is looking. "I need someone to look after the main Hold for me," he jokes. Cape Hold is on very friendly terms with Galen Weyr, due largely to Tiljim's ebulient nature. His baritone voice isn't much good for singing (it sounds something like large, smooth stones tumbling over one another), but that doesn't stop him from regaling his friends and colleagues with amusing sea-songs. He gets along quite well with Jenni, G'iles, and many other Galen riders. He's no diplomat, but his honesty and forthrightness keep him in the good graces of everyone who matters. Status: Not Adopted. To adopt A'zriel, along with Shauth, you must first join Galen Weyr and then notify me. Status: Not Adopted. To adopt D'kel, along with Anvath, you must first join Moon Lake Weyr, notify the Weyrwoman, then check with me. Status: Not Adopted. To adopt C'reb, along with Tilith, you must first join Moon Lake Weyr, notify the Weyrwoman, then check with me. Status: Not Adopted. To adopt F'en, along with Arnoth and Elmi, you must first join Galen Weyr and then notify me. Status: Not Adopted. To adopt N'rode, along with Amroth, you must first join Galen Weyr and then notify me. Other info. : was a Trader's daughter; espoused to Chesric; mother of Chessi, Alric, Siri, Rica, and Balen. Other info. : Journeyman Harper; looks to bronze fire lizard Peg. Other info. : espoused to Danya, father of Den and Anya. Other info. : Mastertanner at New River Beasthold in Keroon; espoused to Alyia; father of Chessi, Alric, Siri, Rica, and Balen; looks to light brown fire lizard Dak. Other info. : espoused to Jame, mother of twin girls Jenni and Ame. Other info. : espoused to Balen; mother of Den and Anya. Other info. : never speaks; may be more intelligent than she lets on. Other info. : carver of fine figurines; espoused to Chessi; father of Jenni and Ame. Other info. : Searchrider; strictly homosexual. Formerly Mihigan. Other info. : Has had about as many relationships (without commitment) and children (most are fostered) as it is possible to safely have. Mother of Katral and Jeruk. Other info. : generally considered candidate material, hyperness aside. Probably Rediral's nephew. Other info. : From a small cot beholden to Roanoke Hold, known for its hard cider. Plays the spoons. Formerly Zydebic, son of Zatarn and Saibica.